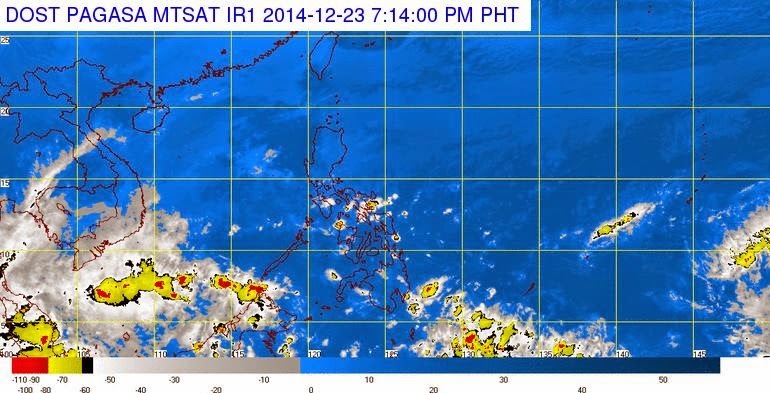 MANILA, Philippines - State weather bureau PAGASA on Monday announced weather forecast for Christmas holidays this 2014. PAGASA said that Low Pressure Area (LPA) is expected to form and enter the Philippine Area of Responsibility(PAR) on Saturday, December 27. However, the weather disturbance is still too far to affect the country. Thus, the whole country will experience partly cloudy to cloudy skies with isolated rainshowers or thunderstorms. Today (December 24), the Northeast monsoon will bring cloudy skies with light rains over the regions of Cagayan valley and Cordillera while partly cloudy with chances of passing light rains over Metro Manila, Ilocos region and Central Luzon. Bicol region and Eastern and Central Visayas will have cloudy skies with light to moderate rainshowers and thunderstorms due to the tail-end of a cold front. The rest of the country will be partly cloudy to cloudy skies with isolated rainshowers or thunderstorms. By Thursday (December 25), the Northeast monsoon is expected to temporarily weaken. The whole archipelago will be partly cloudy apart from localized rainshowers or thunderstorms mostly over the eastern section. By Friday (December 26), CALABARZON, Bicol region, Eastern Visayas and the province of Marinduque will be cloudy with light to moderate rainshowers and thunderstorms. Metro Manila and the rest of the country will have partly cloudy to cloudy skies with isolated rainshowers or thunderstorms. On Saturday (December 27), a Low Pressure Area (LPA) is expected to form and enter the Philippine Area of Responsibility(PAR). However, this weather disturbance is still too far to affect the country. Thus, the whole country will experience partly cloudy to cloudy skies with isolated rainshowers or thunderstorms. For the rest of the outlook period(December 28-29), Bicol region, Eastern Visayas and Central Visayas will be cloudy with light to moderate rainshowers and thunderstorms due to the said LPA. The rest of the country will have partly cloudy to cloudy skies with chances of isolated rainhowers or thunderstorms. Due to the anticipated episodes of the “Amihan” throughout the outlook period, the seaboards of Northern Luzon and over the eastern seaboards of Luzon is expected to be generally rough to very rough. This outlook will be updated as soon as significant changes in the weather pattern occurs.